Let your junior Picasso help decorate their protein-packed plate. Add more fruit to make a smile. Cook bacon in large nonstick skillet until done. Drain on paper towels. Add 3 eggs to skillet; cover. Cook 4 to 6 min. or until whites are set and yolks are cooked to desired doneness. Transfer eggs to individual serving plates; cover to keep warm. Repeat with remaining eggs. 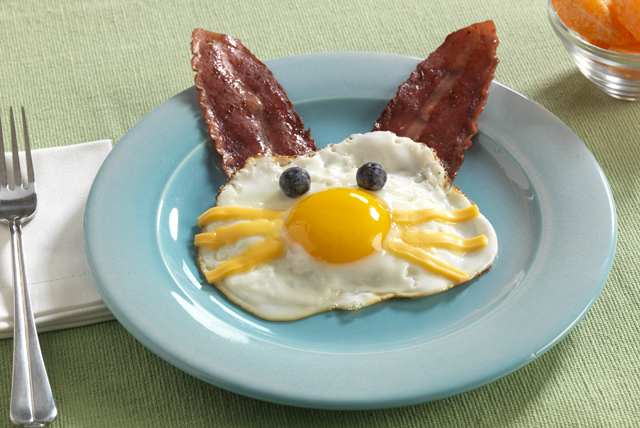 Create each Bunny Egg by placing 2 bacon slices at top of each egg for the ears. Cut Singles strips in half; use to make whiskers. Add blueberries for the eyes. Serve with sliced strawberries and additional blueberries. Buy only refrigerated eggs with clean unbroken shells. Open carton and gently move each egg to make sure it is not stuck to the carton because of an unseen crack. Check the Sell-By Date on the carton. Store eggs in their original carton on an inside shelf of the refrigerator as soon as possible after purchasing. Avoid placing near foods with strong odors that can easily be absorbed. For best quality, use within 4 weeks. Have your little ones help prepare this dish by washing the fruit and unwrapping the Singles. Kids aged 5 and up can cut the Singles using a blunt knife.